This may in fact just be the Best Damn Vegan Chili you’ve ever tried. 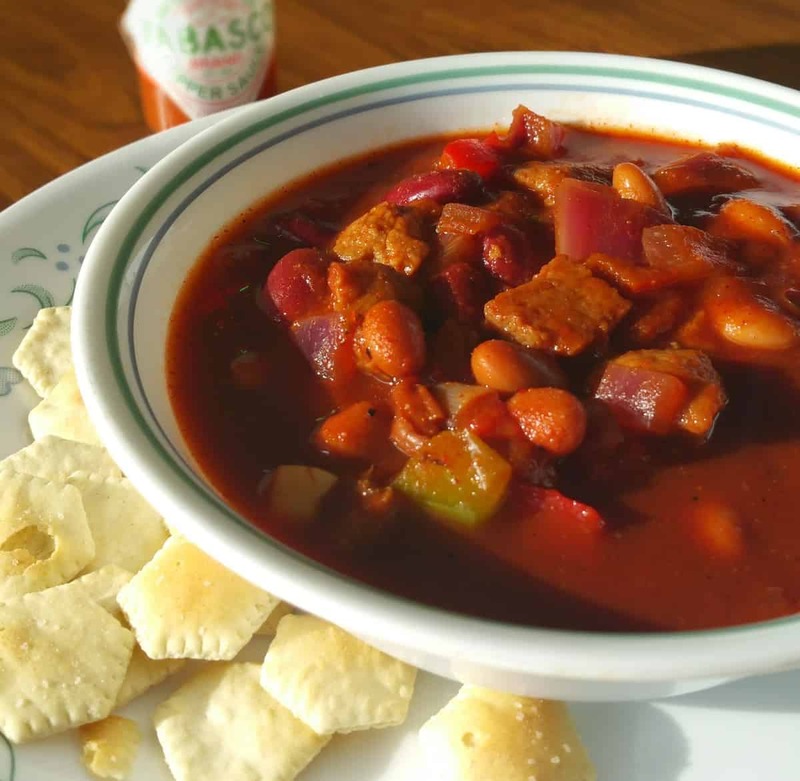 Seriously, I’m not one to brag but…..this Chili recipe has placed TWICE now in various Chili Cookoffs. I’m not kidding, and it not only came in 2nd place (against 9 other NON-Vegan entries mind you)…… it happened in TEXAS! Now I lived in the great state of Texas for 5 years, and it was there that I discovered that CHILI was one of the 4 basic food groups. Meat, onions, peppers? Yeah, THAT chili. And something else I learned, is that Texas chili is something you don’t mess with. Noodles are definitely NOT allowed, let alone carrots or celery or any other weird ingredients. Imagine my horror one day when I found a popular vegan chili recipe that included amongst other things, dates! I know right? Dates!? So in order to preserve what is right and true in the world, allow me to introduce you to what Texas Style Vegan Chili is SUPPOSED to be. I know….. you’re asking how you can have Texas Chili without the meat? Well believe it or not, this recipe holds up just fine without any. Because first and foremost, Texas chili is all about that spice. That magical blend of spices and peppers that gives Chili that distinctive flavor we all know and love. But If you do insist on some kind of chewy goodness in your chili, then it’s about finding a substitute that works. And I’m not talking about those soy-based meatless ‘crumbles’ either. Those are about as processed and unhealthy as a whole box of twinkies. There are LOTS of meat alternatives, but just remember this chile will stand up on its own just fine…. Here are just a few ideas…..
Once you’re veggies are nice and translucent, then add in your meat substitute and cooked until heated through, mixing well. Then add the tomatoes, tomato sauce, broth, beans, and spices. You can adjust the amount of jalapeño to your own individual taste, basically making this as spicy as you wish. The Masa Harina is a trick I learned to help thicken the chili. Nobody likes runny chili – right? Just sprinkle a little on top of the chili and then stir it in. It also adds just a hint of corn tamale flavor – perfect for Texas Chili. After everything comes to a nice slow boil, turn down the heat and let it simmer as long as you can stand it. At least 15 minutes to half an hour – but the longer the better. And although I haven’t tried it – you could probably just plop all these ingredients in a slow cooker for the day. 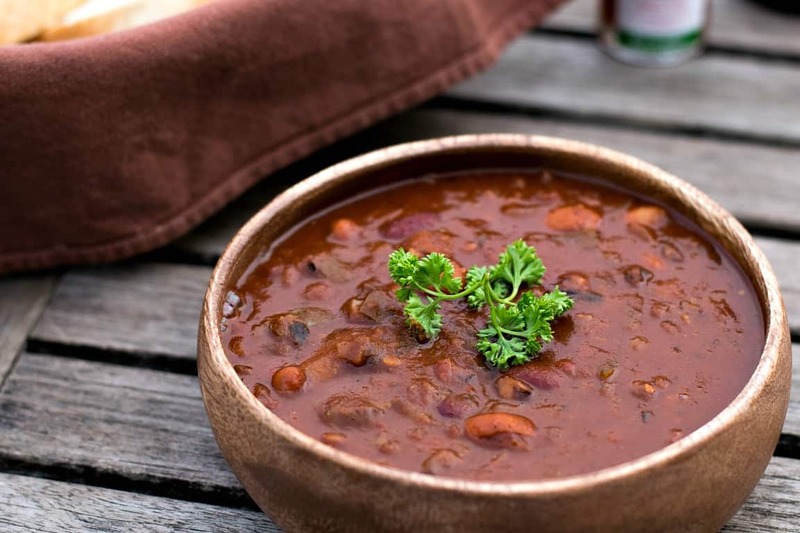 I never get tired of good Vegan Chili and THIS my friends, is as good as it gets…. And if someone offers you chili with rutabagas or some other weird ingredients…..
What Texas Style Vegan Chili is SUPPOSED to be. Thick, rich. and spicy. This may in fact just be the best damn vegan chili you've ever had! Saute in a little veggie broth until translucent and softened. Sprinkle up to 1-2 Tbs of the Masa on top if you think it needs thickening. The masa adds a slight 'corn tortilla' or 'tamale' flavor to the chili. Give the chili one more good stir and bring it to a slow boil. Reduce heat, cover, and simmer for 15 to 30 minutes. Thanks for this recipe – this is really, seriously good! I grew up in Texas, and have been disappointed by what passes for chile where I live now. It is a rather bland, sweet-tasting kind of dish here. Your chile is full-flavored, thick, and rich tasting! Adding the refried beans is a nice touch, something I haven’t seen before in chile recipes. I have seen masa flour added as a thickener, but the refried beans work much better. And the spices were just the right quantities. I couldn’t find seitan, so I tried making my own using vital wheat gluten flour and a recipe that I found in one of my vegan cookbooks. The broth that it cooked in was a vegan version of beef broth, and turned the seitan brown. You are right – it really looks like beef! I ran mine trough my food processor, so it had the appearance of ground meat, exactly like cooked hamburger. I can’t wait to try this chile with my omni friends – I don’t think that anyone will think that this doesn’t have meat in it. However, the seitan doesn’t seem to be a major part of the flavor, so it could easily be left out, if desired. Thanks for the kind comments. Really glad you liked it. I really do make this about once a week and can never tire of it. This last week I used Black Beans and White Beans (was out of kidney and pinto) and man, it was good! Hi Lynn! May I ask what cookbook you used to make that seitan recipe? I’m from Texas as well and have been very disappointed with many of the vegan chili’s that I’ve tried. I made this recipe tonight and all I can say is….This recipe is THE BOMB!! Nothing else need be said!!! Thanks Mark! Glad you liked it! Thanks Mark! Glad you enjoyed it! Thanks for the IP conversion! Hi – thanks for the Instant pot conversion! Did you use NPR? For how long? Hey Chuck — We’ve taken past recipes from you, and cooked them in an electric pressure cooker. It’s easy, tastes wonderful, and the time spent is minimal. We like using dry beans, peas, and other legumes instead of canned foods. Cheaper for those of us on limited funds. This recipe for chili sounds FanDamnTastic — on our list of things to try, and try soon!! The cold weather is great for making a person want to cook soothing foods. Many Thanks! Yes, I used the canned beans and cooked them in the Instant Pot on the manual pressure setting for 10 minutes. What’s NPR? No pressure release? I released the valve as soon as it was done. NPR means natural pressure release. You turn off the IP and let the pressure release on it’s own, takes about 20 mins unless the pot is very full. Glad to know this recipe works well in the IP as that is my preferred method of cooking most meals anymore. Love my Instant Pot so thanks for sharing your success with this recipe in it! Well, I make my chilli out of habeneros (which I grow myself), dried beans, MEAT, and tomatoes from my garden which I froze, canned, or dried. Lots of habeneros. After a while, you build up a tolerance to the heat – you can chop them without gloves. And why would you eat that washed wheat stuff when you can have MEAT instead? Maybe – because – this is a VEGAN website? oops! My bad. but I use lots of peppers, tomatoes, beans, and onions. This was AWESOME and the hubby claimed this as his favorite vegan meal with meat subs that we’ve tried since we went vegan (4 weeks ago)!!! I only used 3T chili powder and used some ancho chili paste in place of the chipotle seasoning. I did add a can of green chilies and it was thick enough that I didn’t add the re-fried beans. I spent most of today looking at your recipes and am looking forward to trying many more. We are brand new vegans, and we will be back for more! Going to try this although not sure I will be able to find the Masa Harina corn flour… Thanks ! I soaked a corn tortilla in hot water then blitzed it. Worked a charm! I’m making this tonight but currently cooking beans that soaked over night…sooo not quite the same. Hopefully it turns out just as tasty though! It should be the same, just drain your cooked beans and you’re good to go. We are having our neighborhood annual chili cook-off in May. This is going to be my entry in the “other than meat” category. I’ll let you know how I do. I love your recipes! Oh heck yeah! I’d love to put “Award Winning” in front of this! Chuck, have you tried this recipe with soy curls? I have them on hand but do not have seitan. Try Pacific Foods brand Seitan. It is wonderful in this recipe. I live in Costa Rica and we don’t have a lot of the convenience vegan foods you can get in the states, but I DID pick up, while on a trip to Florida, a few boxes of Pacific Foods Seitan. I now wished I’d picked up cases of it! It worked so well in this recipe and let me tell you, my husband, who has been so good about eating some of the less spectacular creations I have come up with, just beamed ear to ear after tasting this chili. Cornelius is a nice city. I was born and raised in Portland and my Gram had a farm on Deer Island. I miss Oregon. watch a you tube video on making seitan. It is easy to make ( my first time was not to good but still ok). you can buy the gluten flour online. I am a fool in the kitchen and have a hard time with confusing dishes but this is pretty easy. Unfortunaltely, refried beans are not sold in stores in my country. Also, i am not particularly familiar with local Texas foods. Are the refried beans a must-have in the dish? What can I do, considering I do not have ready-made refried beans? Thanks in advance. The refried beans are used as a thickener. So you could always use a few tablespoons of the Masa Harina Flour like I mentioned in the recipe. Or corn starch. Or you could take some pinto beans and mash them – which is all refried beans are anyway….. Thanks for the speedy reply. If I do use Masa Harina to replace the refried beans, should I add more than mentioned in the recipe? I’d use the amount specified in the recipe and check thickness after. The Masa can add a corn tamale like flavor – so not too much. This sounds great. I can’t wait to try it. Any thoughts of cooking it in an Instant Pot? Hi Chuck, I’m a brand new vegan and I’m going to make this today. Going to the market. I will let you know how it turns out. I made this today, and won a third place trophy in a neighborhood chili cook off, and there were nine other recipes, only two of them were vegan! And this is Texas! Very good! AWESOME! I knew this would be award winning chili one day! So happy you won and thanks so much for sharing! Good job! I love this. 🙂 Congratulations! Glad you liked it! Yeah a Poblano would spice it up a tad bit 🙂 I like to use the “tame” Jalapeños Slices you get in the jar. Just a handful and maybe a little juice….perfect. Boyfriend didn’t want to buy the jarred stuff. So we tried the poblano. Thanks. I am not a fan of the fake meats. I just found your taco meat recipe and it sounds fantastic. I was wondering how this may work out in your chili? I bet it would be really good. Give it a try and let me know! Can’t wait to try this out! Sounds yummy! Is there something I can use to sub for the cumin? My husband is allergic to it. Made this last night. I used Morningstar Meal Starter for the meat substitute. It is fantastic! I think next time I might try black beans instead of Morningstar to see if I can minimize the processed foods. Thanks for sharing this recipe! This chili is delicious but it looks like it will serve about 6 ppl, NOT 16. I am making it for a big group for Halloween tonight, so am a bit worried…. Our family tried your chili last night, And have to admit that it is the best WFPB chili we have had. Thanks for sharing. Well Done Sir. Hopelessly addicted to this chili – thanks so much! This is truly an excellent chili! I made it for my family last weekend and it was so good that I decided to make it again for my work chili cook off and won 2nd place out of 12 other chilis. Thank you, thank you, thank you! Besides cooking the onions first, would cooking the chili in a crockpot be ok? This looks delish! Lots of people have done it, so yeah – no problem. This is my new go-to vegan chili recipe. While I am not vegan, we have family members who are and they LOVED it. Will be making this on a regular basis. I think that the harina flour and refried beans put it over the top. Thank you! I feel like I have found my new favorite meal! I’m a born and bred Texan, so chili is nearly a religion. This recipe is my new testament! Fyi. I included the whole can of refried beans and left of the oregano since I didn’t have any. Now some rice, and life is good! This chili is awesome! I made a batch and also added a whole bag of chopped frozen spinach and it is now my very cold weather comfort food. I’m trying to figure out how much exactly this cooks…I’m making it for work tomorrow and wondering if I need to double bactch it?!?! What size crock pot would this go in?? It makes a lot. It could easily feed a family of 4 with leftovers for a day or two. So close! Too much tomato, not enough heat for me. good none the less. Texan, vegetarian and multiple chili cook-off winner including CASI events. Try adding white pepper, cayenne and 1 tsp cumin just before you add the masa. Also 1/2 – 1 tsp Mexican oregano with the initial spice mix. FYI we’re making chili beans, not chili. No beans allowed in Texas style chili. I’d always considered my chili recipe (with meat) the absolute best, but somehow it just didn’t translate to vegan so well … Yours tastes so close (I left out the chipotle – allergic to it ) and I think it’s the 1/4 cup chili powder, retried beans, and masa corn flour. I’m so happy to find my new chili recipe! And my husband agreed that it’s by far the best vegan chili ever!!! Really good. Will cut spice down a little next time though. It’s very spicy. OMG absolutely awesome ….. hubby and I made it together and will share the consequences later haha loved it. This is a keeper. I made this today and my husband and I just loved it. This recipe is going in the recipe file for do overs. What kind of Chili Powder did you use? I use regular grocery store McCormick’s Chile Powder and it is not hot at all. I can’t get chili powder in Mexico. How do you suggest I make my own with what proportions of spices? Thx! I love this recipe. I have made it multiple times and people really like it. The way I love to make it is using diced jackfruit as meat. Some friends even thought it was beef!!! I totally recommend using jackfruit! I also leave it soaking for pretty long after it has come to a boil and cooked for a while, Ideally I leave it soaking in the pot overnight and it just makes it a lot more intense so I definitely recommend doing that too. Also if it is too spicy just add some diced potato, they kind of neutralise it and even if they don’t belong in the recipe they add a nice taste in my opinion. I just cooked up a pot of this delicious chili, and my carnivore friend immediately packed some up to take to work for his lunch. It’s wonderful, exactly as written. Thank you!! Have you ever doubled the recipe in your Instant Pot? I feel like I need to make a huge batch but I wasn’t sure if doubling the recipe would go past that ‘do not fill past here’ line. Thanks in advanced! It might be a bit much for my little 6qt to double the recipe. An 8qt IP? Maybe. Hi there! Love this recipe but am confused on serving size. Because we get maybe about 8 servings of chili out of this recipe???? That’s why I hate listing the number of servings. Everybody is different. My 1 serving might be 2 to you. Thank you so much for this recipe. I made this today and it’s wonderful. We are having a chili potluck at work and I work with a lot of vegetarians and vegans. Even though I’m not vegan myself I wanted to make something everyone could enjoy. My only mistake was I grabbed a can of chipotle rotel instead of fire roasted rotel and didn’t know until after I poured it in. It still came out wonderful even with that extra smokey flavor. My vegan friend loved it but suggested maybe adding a little vegan Worcestershire to give it some depth behind the spices. I think it was fine the way it is but do you suggest anything for a little more depth in taste? Mr. Underwood you genius! I know this recipe is older, but I only discovered it a month ago. So I’m 10 months into veganism, and in New England the crisp Fall is upon us. We’re also chili snobs if you will, which might be weird to some (coming from a Yankee), but we have chili cook offs (we have a well known one here in NH called Beer & Chili Festival) the same as anyone else. 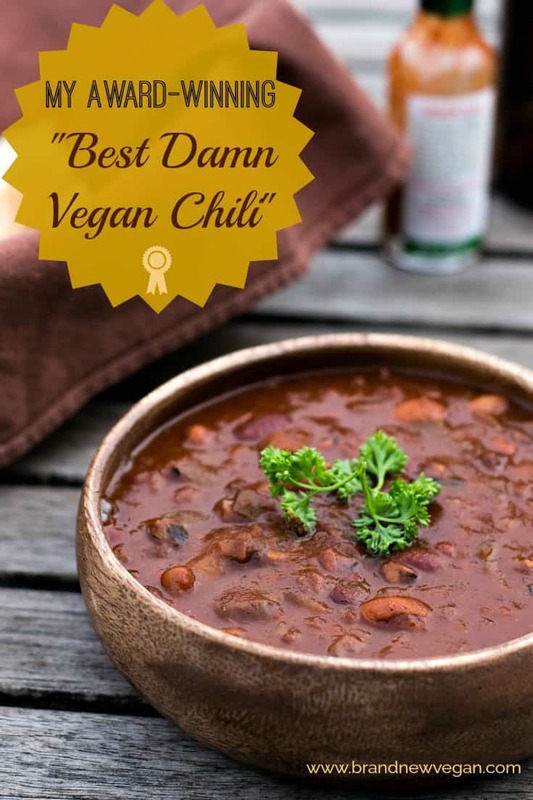 My hubby joined me in the vegan lifestyle, so to make sure he knows he isn’t missing out on anything from our previous meat filled life – I went on a serious search for a damn good chili recipe — and here you are! I said to myself “if a Texan considers this award winning, it really must be that damn good”. I’ve made this 4 times in the last 4 weeks. Yes! Once per week my husband and I kept wanting this deliciousness. To go further I made my parents and sister, and her clan of husband and 2 toddler boys, this amazing recipe. All 5 star rave reviews! Heck they all asked for the recipe! And my folks aren’t even fully vegan yet (they’re on that train now.). It’s really important to me that my loved ones learn and experience how great vegan recipes can be— this inspires people to keep going or even start as most are afraid of missing out (FOMO). That’s the trick to helping people see that you don’t have to deprive yourself on veganism. There’s a vegan version of everything, and most of it is just as good, if not some – better! This recipe falls into that category of “better than meat chili”. This is coming from someone whose husband and parents had a hard time believing some vegan foods are better than non vegan – and they LOVE this recipe!. They’re all obsessed with this chili. Now…I know you said 1/4 cup of chili powder but we don’t like too much heat. I made it to a T the first time as your recipe states. It was awesome, but I preferred it with a little less chili powder. So those who ar wondering — yes, using that much really is the best way, but start with using say…1 tablespoon less than the recipe calls for if you’re nervous to use that much. With this recipe you really have to play with it a bit to get it the way you prefer but try it at least once as is. Oh and don’t make the mistake of not using enough, because it really is needed (makes all the good difference). I also skipped the chipotle part, and only stuck with the bulgur as my meat substitute- so far it’s proven the best way. I do plan to try a meat substitute out of curiosity, maybe even red lentils, or grounding up some Beyond Burger meat. The only thing is, the recipe as is doesn’t need much changing. It’s really perfect the way it is. So don’t make the mistake of changing ingredients drastically. There’s a reason this has such rave reviews. It fed 4 large bowls the way I made it (large I mean like 3 cups) so making more is recommended if you want to feed more than 4 hungry people. Thank you Sir! I’m a big fan and my family thanks you kindly. It’s so easy, most of us even have most of the ingredients. Love and appreciation from your friend in Portsmouth, New Hampshire. This is definitely the best! I made this last night. I made the cauliflower taco ‘meat’ – I had to add separately as my partner hates cauliflower and mushrooms. I added some of the left over walnuts, replace the cauliflower for carrots and celery. the carrots where done in the food processor. Such a lovely dish that will be so versatile. so glad I tried this. Thank you so much for sharing. . 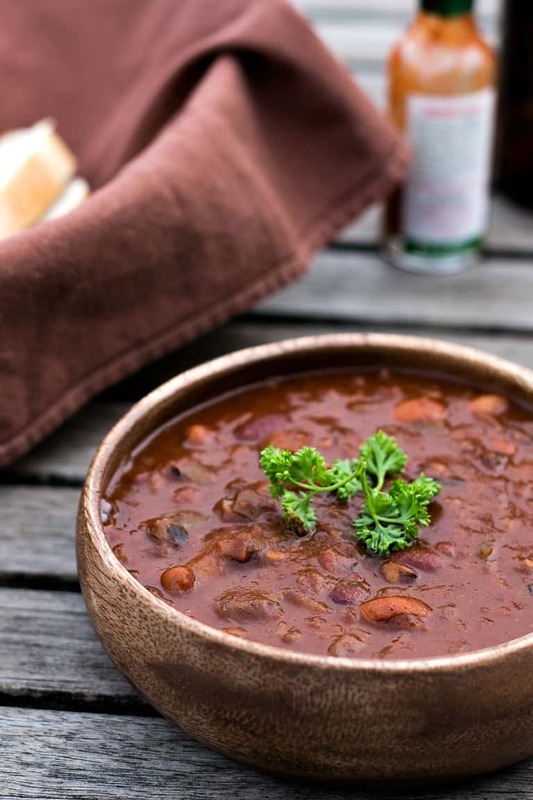 This vegan chili will fool any meat lover. I have tried many vegan chillis and this recipe is by far the best. Hey! Question, do you think I could make this chili using lentils as a replacement for the Kidney Beans & Pinto Beans? I am not a fan of those types of beans but this chili recipe looks amazing! Please let me know your thoughts on how many cups of dried lentils to use. OMG this chili is fantastic 🤗🤗 it is now my new favorite🎉❤️ thanks so much chuck of Brand new vegan🎉🎉🌶YUMmm 🎉 I used 1 tablespoon of the jalapeño slices and 1 tablespoon of the juice and it is perfect 👌 with heat not too much and 1 tablespoon of the corn Masa flour to thicken a bit. The bulgar is a great texture addition 🥰🌶👍🏼 thanks again Chuck Underwood 🙋Oh I cooked in my instantPot -manual setting 20 min, turned off and let set 10 min ..steam was gone and opened to this delicious chili! Delicious! I needed a vegan chili option for a family member at a family gathering. Came across this recipe and decided to try it. It was a huge hit! Many people told me it was their favorite chili out of four, including two with meat. I added “meat crumbles” to it, but I don’t think they would have been needed. I was looking to keep it mild, so I left out the jalapenos and chipotle chili powder, but my husband the resident flavor guru added extra oregano, extra cumin and also extra (Hot Hungarian) paprika so I think that last addition gave it a little more heat than I was expecting. But thanks for the great recipe! It was not only delicious, but quick and simple (win-win-win!). I would definitely make it again, even as a non-vegan. Can this chili be frozen? I don’t know what possessed me to look up a vegeterian Chili recipe, much less vegan. My husband and I love spicy chili and we love beef. But one other thing I love is vegetables and I love riced cauliflower. So I made this with the riced cauliflower and we both agreed that this was the best chili I have ever made. We froze the left overs and then ate it over rice. You really have me thinking here. Just saying….